Everything seems perfect at the beginning of all relationships, and this can last for weeks, months, or even years. But if you don’t take care of it, eventually your relationship may start to fall apart, without you knowing where it all went wrong. What I want to share with you today is what John Gottman Ph.D., renowned relationship expert, discovered after his most extensive research on marriage. He found 4 main communication patterns that will lead any relationship to divorce, he called them the four horsemen in his book: “The Four Horsemen of the Apocalypse”. Let’s talk more about these 4 common communication patterns that negatively impact your relationship. Criticism is the first behavior that is characteristically in couples during a conflict. This happens when you attack your partner’s character or personality, instead of the behavior itself. The second horseman is defensiveness. This is when you find yourself playing the victim and your behavior changes to: “The problem is not me”. But the real problem with defensiveness is that you avoid taking responsibility of your own behavior and instead you either blame your partner or make excuses. You forgot to purchase a gift for a birthday party you were invited to and your first reaction is: “It wasn’t my fault!”. A better idea would have been to talk it over with your partner so next time you are invited to a birthday party you discuss who is the responsible of buying the present instead of assuming the other will. Contempt is the third horseman. Contempt is when you show disrespect to your partner by sneering, name-calling, insulting, sarcasm, rolling your eyes, mockery, hostile humor and condescension. Being contemptuous is to put someone down, to think “I’m better than you”. Contempt is extremely emotionally abusive in relationships. It can end your relationship the quickest. Your partner is coming back from the supermarket and forgets something that you needed. “How could have you forgotten, you idiot! (Rolling eyes) You really can’t get anything right! I should have known better than to have asked YOU! I’m better off doing it myself! (With a sarcastic hostile tone). This is the last horseman and couples that engage in this behavior are more likely to get divorced mainly because it can cause a lot of emotional distance. Stonewalling is basically when one partner tunes out and becomes nonresponsive. People often stonewall because they become overwhelmed internally and they stop thinking clearly. Research shows that men tend to stonewall while women want to “talk it out” to a point of causing more damage to the relationship, making the other partner even more distant. You are complaining to your partner and he/she is looking to the side or crossing his/her arms. Their reaction could be to give you the “silent treatment” or to abruptly leave without telling you where they are going. How can you prevent destroying your relationship? To prevent your relationship from falling apart you need to understand that conflict is part of a healthy relationship; it’s how you and your partner communicate your needs and differences to each other. Be aware of your behaviors and understand what you are really upset about, and target that, rather than using passive-aggressive behaviors to communicate how you feel with your partner. Try focusing more on what you want and less about what your partner is doing wrong. It’s how you react to the conflict that predicts the future of your relationship. 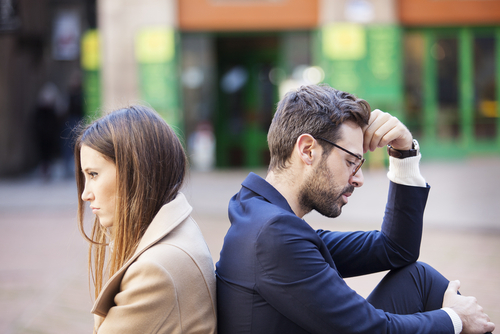 If you find yourself falling in these 4 common communication patterns, don’t panic! Recognizing that you’re doing something that could be hurting your relationship is the first step to actively combating it. Now it is time to seek help in establishing healthy communication tools. Schedule an appointment with a therapist who specializes in relationships and sexual health at Center For Change & Well-Being.